Creationists commonly cite the Bible as evidence of a recent arrival of the human species. Their “event” is tied to Creation, or Genesis. Figures I have heard and read seem to center around 4,000 years ago, with Creationist data points ranging wildly from 600 to 10,000 years ago. These dates today utterly lack credibility to modern evolutionists and lay science students alike, with the overwhelming geological and anthropological evidence showing that modern man emerged from Addis Ababa more than 40,000 years ago. The question that has always bothered me: how could presumably intelligent and articulate Creationists fatally wound their own beliefs with such wildly out-of-whack dates? A possible clue comes from Herodotus, the ancient Greek historian generally considered the first in the western world to record and compile a credible representation of the beliefs, anecdotal histories and myths of the early “western world”. He wrote at a point in time of about 200BC. In Book II, Herodotus starts introducing the reader to the rest of the known ancient world. He spends a great deal of time on Egypt, and he did visit Egypt, though he did not actually see some of the sites he chronicles. For example, he reports that the hippopotamus has the tail and mane of a horse. But we begin to get a feel for the smallness of the then-known world: Greeks in the Aegean, Egyptians and Libyans in north Africa, Assyrians and Persians in what today we would call the Middle East. There are reports of other barbarians (any peoples other than Greeks) in the hinterlands of Europe (Iberia, or Spain) and perhaps a hint that they had heard something of the abandoned monuments at StoneHenge. In the world of Herodatus, “Asia” meant the region in which we found Persia – roughly, modern Iran, which we call the “Middle East”. Of the 6,000 year old cultures in China, nothing seems to be known. Herodotus reports on the record-keeping of the Egyptian priests, who claim to be able to trace the kingly lineages back 13,500 years or more. The real item is that he also reports the observation of other Greeks, that peoples tend to ascribe the Dawn of Mankind to the age of writing in their region. It was commonly believed in those times that humans are born with a working knowledge of their native tongues. So, perhaps it was believed that as soon as a tribe was “born”, its scribes would start writing about it, this giving us a way to discover the origins of man. Ancient Egyptian writing may go back to the Old Kingdom, 3000BC give or take. The Dead Sea Scrolls may date to 100BC. But by this time the Roman Army has reached a strength of 300,000, and Teotihuacan reaches a population of 50,000 in Mexico. In 2000BC (according to Wikipedia) we find Stonehenge completed, the first ancestors of the Latins (Etruscans), the Minoan palaces in Crete, dynasty wars in Egypt, and a bronze age beginning in China. The Sumerians define the cubit, and Reu, son of Peleg, is born according to the Hebrew calendar. Science has long since found that the archaeological and paleontological records reveal “homo sapiens” – modern man – has been around much longer than that. Most recently, we can assign credible dates or ages to the migrations that map modern man’s emergence from Africa to all corners of the globe. We know that the Americas were populated by emigrants from Asia across the Bering Straits, probably over the Bering low-water land bridge during the last ice age over 10,000 years ago. But I didn’t know there were actually two migrations. An earlier and major wave of humans pushed out of Africa through the Middle East, India, Australia, Southeast Asia, China, Japan, the Kamchatka Peninsula, Siberia, and Alaska, apparently getting as far as modern Oregon. This was 50,000 years ago. This same mitochondrial “branch” spawned an offshoot 45,000 years ago which split into Central Europe (25,000 years ago), and, in two more waves, to western Asia (40,000 yera ago), Spain (30,000 years ago) and, by a different route, northern Europe (10,000 years ago). And there were other “waves” emerging from Africa and from other “nodes” on the map. The map is from a major article in the July Scientific American, “Traces of a Distant Past”, by Gary Stix. It’s important to note that the migratory “waves” discussed, and depicted on the map, were not continuous population movements; a population would most likely split from a large parent group, emigrate to a new area, put down its roots and grow in size, before wanderlust and perhaps changing ecological fortunes prompted further migrations. Please note that even the newest migrations were complete thousands of years before the earliest known examples of writing or calendars. 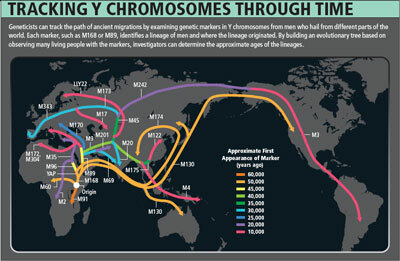 All the paths can be traced through genetic markers to a single “Mitochondrial Eve” about 200,000 years ago. This “Eve” was, by the mathematics of DNA, a single human being. As Stix points out, she was certainly not the only human forebearer to populate the early world. But she was the only one whose blood line actually survived all the way to modern times. And her distinct genetic markers are in all of us. The point of origin (by several different methods) seems to be in what today is Ethiopia, in the region where Addis Ababa was founded in modern times. This is also the site of “Lucy”, perhaps the world’s oldest fossil record of one of our prehominid ancestors. Lucy was a much earlier pre-human, Australopithecus afarensis (3.9 to 3 million years ago). So, for the first 3.8 million years, the species that we trace to ourselves today didn’t move at all. Then, in a brief 60,000 years, something happened. We populated the entire globe. Interestingly, many Native Americans and aboriginal Australians are not interested in helping scientists map migration routes through DNA sampling. According to the same edition of Scientific American, tribal cultural belief is that their people always inhabited the land they do now. The finding that they actually migrated via Siberia 13,000 years ago is not exciting good news; it flies in the face of faith. Something like 99.9% of the DNA material in the human genome is the same for every human being alive today. It’s the other 0.1% that carries the genetic variations that we ascribe to race, geography, climate and appearance. Humans are almost instinctively able to visually detect subtle differences of facial cast, gait, anotomical proportion and such to recognize differences of ancestral origin. In parts of the world, villagers can often tell by appearance who belongs to a village a scant hundred miles away. In ethnic melting pots like Europe and the US, statements like “he looks like a Scotsman” may have more validity than meets the eye. 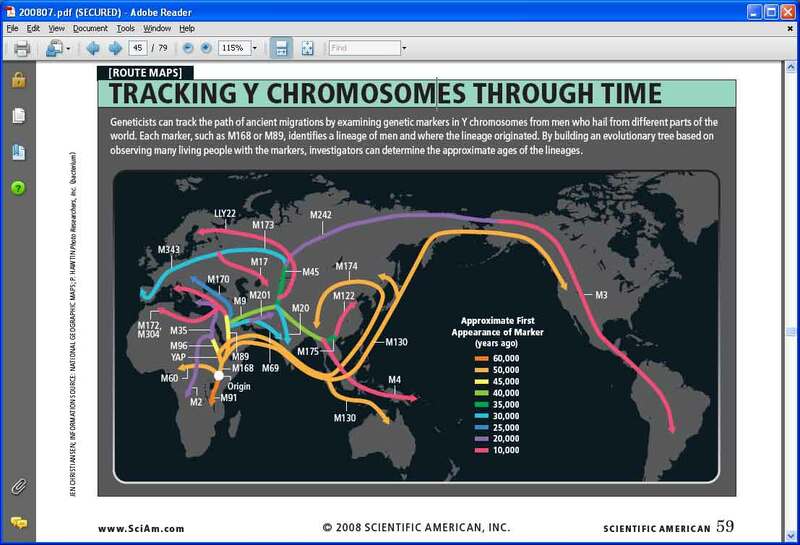 If you have ever wondered why many South Americans seem to have some Asian features, take a look at the Scientific American Chromosome map. This entry was posted in Notes, Reviews and tagged Reviews by Alex. Bookmark the permalink. Herodotus did not write around 200 BC but around 430 BC.